With all the different apps and services Google offers, you've got no shortage of choices for how to get in touch with people, ranging from a simple email to a video call. And while all those options let us pick the most appropriate method for a given circumstance, sometimes accessing a particular one isn't as streamlined as we'd hope it would be — and that's especially true when we're looking at the intersection between more than one of these services. Today we're hoping to shed a little light on one of the less-intuitive corners of Google's communication infrastructure, as we check out how to send Hangouts messages through Google+. Back in the long, long ago, access to Hangouts was pretty prominently placed in the Google+ interface, but that's dropped away as the social network has evolved over the years. As of now, the most obvious ways to access Hangouts from Google+ are via the Google apps menu when browsing on the web, or tapping the hamburger menu in the Android app and checking out the Google apps list at the bottom. But there's also a much more straightforward way to get a Hangout going from Google+, even if it took us a while to notice it. 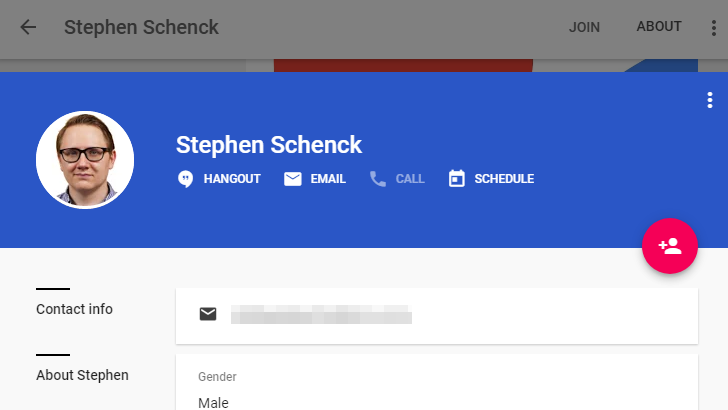 When viewing a user's profile, one way to access their Hangouts info is just to click on their name. Now, we'd forgive you for assuming that was just a link to the profile itself, reloading the page when clicked — like what happens if you click the headline on this post. Instead, clicking the user's name brings up a card with bio data and recent posts, but for our purposes we're most interested with what's up top: a bunch of contact links, with Hangouts first among them. If you're not already connected with someone, things like their email and phone may be grayed out, but we were looking for Hangouts, and we sure found it. You can also pull up this same card by clicking the "About" link in the profile, which we'll concede would have been a more obvious strategy. 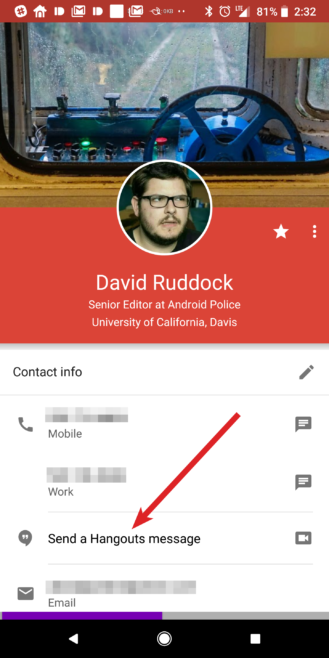 Then there's one more way to access Hangouts for a user you know, by hovering your cursor over their user name to view a contact card. Again, you may not see anything useful here for someone not connected to you, but if they are, you'll have your pick of Hangouts options. On Android, you're going to once again look for “About” at the top of a user's profile, and tap it to get a similar card view — just be aware here that the app seems to be a little more protective than the web interface, and you may not see that Hangouts link unless you're already connected to the user. But for your existing friends, it's easy to use Google+ on either the web or the Android app to send out a Hangouts message — so long as you know what you're doing.